ARE YOU A BEGINNER AT HANDSTANDS? TIRED OF KICKING UP AND NEVER STICKING IT CONSISTENTLY? IS THE FEAR OF KICKING UP HOLDING YOU BACK FROM TRYING? DO YOU SIMPLY WANT TO TRY SOMETHING NEW AND REAP THE BENEFITS OF A VERY REWARDING SKILL? We pride ourselves on constantly providing the best content to all of our members so that they achieve a handstand in the shortest time possible, and all of the great feelings that come with acquiring such a wonderful skill - being up side down and balancing. 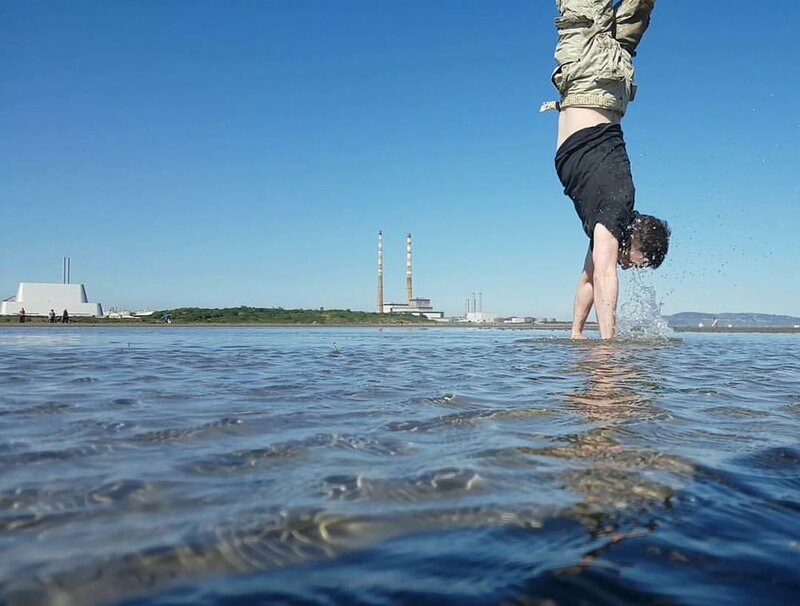 All it takes is the right process from experienced teachers who have taught handstands to hundreds of people with the most popular handstand classes in Ireland over the last few years. - Instantly banish the idea of just kicking up and getting lucky. Luck is a myth. Education and application of perfect principles is where success is found. - Teach you how to build on your current level with 100% individualized work. - A fun but NO BS approach to getting your handstand in the quickest time possible! - Step by step, crystal clear system to your handstand. - Spot and teach you how to spot safely, effectively and with the knowledge of what to look for and how to fix it. WEAR COMFY CLOTHES. WE TRAIN BAREFOOT/IN SOCKS. DO NOT BRING ANY SINGLE USE PLASTICS. WE PROVIDE FILTERED WATER. Some random posts below from members/friends during their handstand training - some as far as Panama and Sri Lanka! Awesome!! THERE ARE TWO THINGS TO UNDERSTAND WHEN TALKING ABOUT THE HANDSTAND. THE FIRST, is to realise that we never achieve pure static balance. Not while we are alive anyway. THE SECOND, is to acknowledge that our very nature has us in constant pursuit of it - whether you call it finding centre, homeostasis, or balance... it is something we are all searching for subconsciously and for some of us, consciously. What this gives us is an understanding that the process of balance, in life and in any area, is actually a process of rebalancing. We are constantly trying to achieve balance, and it is fleeting. Join us for a 2 hour session of handstands to bring you from the floor to upside down consistently and with the knowledge to pass on to your own clients or kids. As each week passes we build on the foundation and progression for each person, while very happy to have complete beginners each week. This class, like everything we do here, treats each individuals mobility, strength and technique issues and gives a crystal clear picture of how to achieve your handstand. Taught by Andy & Anthony, our process has developed by learning from Ido Portal & Yuval Ayalon in person and most recently learning the finer details from Emmet Louis on corrective techniques & modern methods of mobility. We have coloured inside and outside the lines to get an understanding of this art from every angle and are happy to offer the experience to everyone. There are many, many benefits for doing handstands - we have been drawn to it for years and years and still can't get enough. Whether you 're doing it to benefit your CrossFit, or your mood, Handstands are just awesome! We have a full barista set up in the studio, a Nuova Simonelli Aurelia and a Mahlkonig K30 grinder. We use 3fe beans and 3fe standards with the coffee. All in all you have a very worthwhile and enjoyable 2 hours on a Saturday morning in Terenure with good people.